KUWAIT: Kuwait marks the 13th anniversary of its late Amir Sheikh Jaber Al-Ahmad Al-Sabah’s death today. All Kuwaitis have been recalling the deeds and achievements by the ‘Amir of Hearts’ who spent his life serving his country and people. Sheikh Jaber Al-Ahmad Al-Sabah, who was born in 1926 in Kuwait and died on January 15, 2006 after being in power for 29 years, was the country’s 13th ruler, and the third Amir in the state’s constitutional era, which began with signing the Constitution on November 11, 1962, by the late Amir Sheikh Abdullah Al-Salem Al-Sabah. Since he came to power in 1977, the late Amir Sheikh Jaber led the country to development and progress in all domains and on all levels, and enhanced its status on political, economic and charitable arenas across the globe. The late Amir was so keen to establish balanced bilateral relations with the world; his wise leadership helped Kuwait overcome challenges and address crises it faced, mainly in the 1980s and 1990s of the last century. During his tenure, Kuwait has remarkably witnessed an urban renaissance and development in all sectors and general utilities, with a successive pace. He paid much attention to the Kuwaiti youth. This was manifested in 1992, when the Public Authority for Youth and Sports was founded and entrusted with caring for the affairs of Kuwaiti young people and promoting their physical and mental capabilities. On the plight of the Iraqi invasion 1990, Sheikh Jaber’s wisdom and experience have managed to mobilize big support by sisterly and friendly countries to drive the Iraqi troops out of the country and liberate the entire homeland. Due to his wisdom and the support of Kuwaitis, the State of Kuwait resumed the renaissance march, achievements and reconstruction, and removed all traces of the Iraqi invasion. He paid much attention to the martyrs’ children through establishing the Martyrs Bureau on June 19, 1991. He also spared no efforts on the release of Kuwaitis held by the Iraqi regime. He cared about Kuwaiti women, and issued in 1999 a decree giving women citizens’ full political rights. Among the prominent institutions established during Sheikh Jaber’s reign were the Public Authority for Social Insurance to secure dignified living conditions for the elderly, and the Reserve Fund for Future Generations, which benefited the Kuwaiti people during the Iraqi invasion. On the political level, the late Amir launched several initiatives on Gulf, Arab and international levels, and suggested the idea of establishing the Gulf Cooperation Council (GCC), which mirrored his keenness on the joint cohesion and common destiny to face foreign challenges and political blocs. In the 1996 GCC Doha Summit, Sheikh Jaber suggested the formation of a 30-member consultative council in order to provide proposals to the GCC leaders to promote the process of decision-making. The late Amir also prioritized Muslim and Arab issues as he proposed the establishment of the Kuwait Fund for Arab Economic Development in 1961. He chaired the board of directors of this institution, which offered financial support to development efforts not only in the Arab world but in many others. He also dropped interest of debts due on poor countries. The late Amir was keen on taking part in several conferences and meetings across the globe, and paid many official visits to enhance Kuwait’s status globally. In a poll conducted by a London-based media institution in 1995, Sheikh Jaber was chosen as the humanitarian personality of the year among five million Arabs, in recognition of his charitable actions and financial support for many global institutions. ‘The Amir of Hearts’ was engraved in all people’s minds and hearts; as several places were named after him like Jaber Al-Ahmad Hospital, Jaber Al-Ahmad Armed Forces Hospital, Jaber Al-Ahmad International Stadium, Jaber Al-Ahmad City, Jaber Al-Ahmad Cultural Center, Jaber Al-Ahmad Causeway and others. Furthermore, many places in several countries were named after him, in recognition of his status in the hearts of many people not only in Kuwait but also in many Arab and Muslim states. Chairman and Director General of Kuwait News Agency (KUNA) Sheikh Mubarak Al-Duaij Al-Ibrahim Al-Sabah affirmed that the march of the ‘Amir of Hearts.’ On the 13th anniversary of his passing, Sheikh Mubarak Al-Duaij said that the late Amir was one of the most prominent founders of the State of Kuwait, as he contributed to building the modern state and establishing its foundations and consolidating its institutions since the early 1950s. 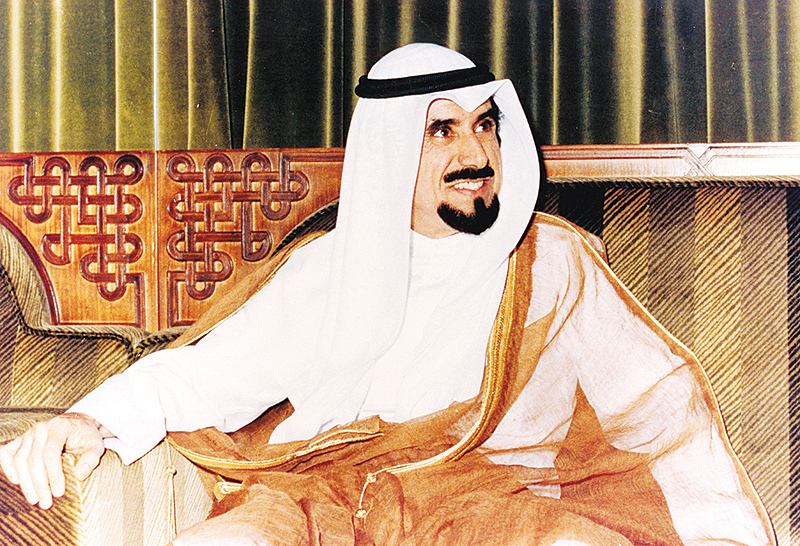 During his ruling, Sheikh Jaber paid more attention to concerns of his people and the interests of his country, achieved security and stability of Kuwait, maintained its sovereignty and unity and strengthened its position in the world through the establishment of strong diplomatic relations with various countries. History will remember with pride and appreciation that Kuwait got a high position among other world countries and got a strong and influential presence in international forums and global events during the rule of the late Amir Sheikh Jaber Al-Ahmad, Sheikh Mubarak explained. The late Amir kept Kuwait safe with his wisdom and ability to overcome tribulations despite all challenges and difficulties experienced by the region during his reign and was keen to keep it away from the dangers and conflicts surrounding it, he noted. Sheikh Mubarak Al-Duaij remembered the huge efforts made by late Sheikh Jaber with late father Amir Sheikh Saad Al-Abdullah and His Highness the Amir Sheikh Sabah Al-Ahmad Al-Jaber Al-Sabah during the Iraqi Invasion and how they managed to mobilize the world with the largest international coalition to expel the occupation forces and to liberate and reconstruct Kuwait. He pointed out that this coalition came as a result of Kuwait’s wise policy and its close and balanced relations with various brotherly and friendly countries, and its efforts to achieve peace and stability in the world. 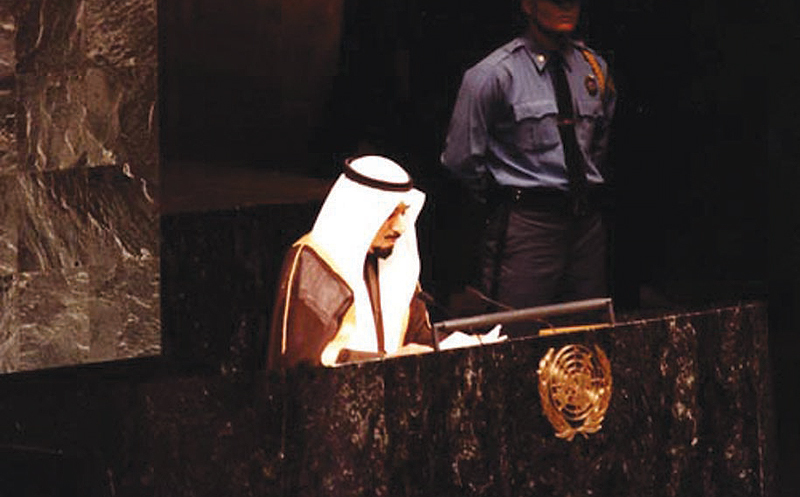 He referred to the unique initiatives launched by the late Amir and had a great global impact, such as the establishment of the Kuwait Fund for Arab Economic Development, which provided great economic assistance to many countries, the idea of establishing the Gulf Cooperation Council and its remarkable initiative to cancel the debts of poor countries. He also referred to Sheikh Jaber’s initiatives to establish a reserve fund for future generations, Zakat House, Kuwait Finance House and other immortal historical achievements that reflect his deep insight and wisdom.